8/13 UPDATE: The hacker’s Twitter account (@GUCCIFER_2) has been suspended in the wake of the latest document dump. However, his WordPress blog--to which “Guccifer 2.0” uploads his stolen goods--remains online. After disappearing for a couple of weeks, the hacker “Guccifer 2.0” returned late this afternoon to provide a new headache for Democrats. In a post to his WordPress blog, the vandal--who previously provided nearly 20,000 Democratic National Committee e-mails to Wikileaks--uploaded an Excel file that includes the cell phone numbers and private e-mail addresses of nearly every Democratic member of the House of Representatives. 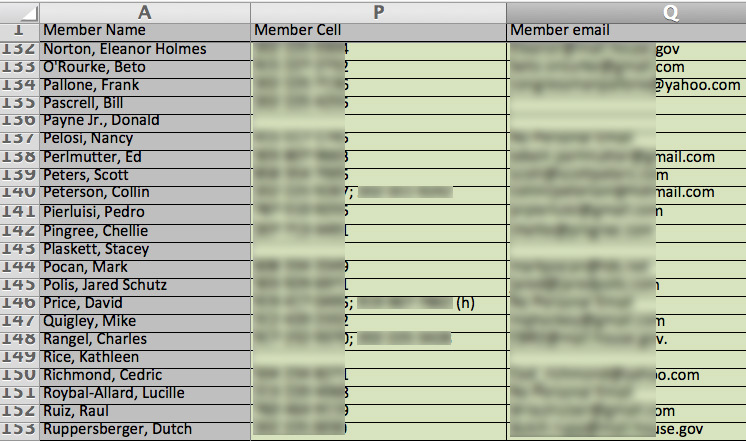 The Excel file also includes similar contact information for hundreds of congressional staff members (chiefs of staff, press secretaries, legislative directors, schedulers) and campaign personnel. In announcing the leak of the document, “Guccifer 2.0” reported that the spreadsheet was stolen during a hack of the Democratic Congressional Campaign Committee. “As you see I wasn’t wasting my time! It was even easier than in the case of the DNC breach,” the hacker wrote. Along with the Excel file, “Guccifer 2.0” also uploaded documents that included the account names and passwords for an assortment of subscription services used by the DCCC, from Lexis-Nexis to Glenn Beck’s web site (password: nutbag). While “Guccifer 2.0” claims to be Romanian and an “unknown hacker with a laptop,” cybersecurity investigators have concluded that he is part of a Russian intelligence operation that has targeted the DNC, Hillary Clinton campaign staffers, and assorted Republicans, including John McCain, Lindsey Graham, and Michele Bachmann. The FBI is investigating the DNC and DCCC hacks along with attempts to compromise the Gmail accounts of Clinton campaign staffers through the use of “spear phishing” e-mails (as detailed in a TSG story published this morning). While the publication of the DCCC spreadsheet will, no doubt, unleash a torrent of prank calls, vulgar texts, and other mischief, its theft provided “Guccifer 2.0” and his cohorts with myriad additional hacking opportunities. Armed with the private, non-governmental e-mail addresses of members of Congress and their aides, the hackers likely used those addresses in malicious “spear phishing” attempts. If successful, the resulting breaches yield not only a compromised account’s e-mails and attachments, but can provide access to storage services like Google Drive. Additionally, hackers would also obtain the names and e-mail addresses of the individuals with whom the victim corresponded, further propelling a cascading wave of cyber intrusion. In a series of e-mail exchanges last month, "Guccifer 2.0" described himself as a committed "hacktivist" and bristled at TSG's portrayal of him as a thief. "Stop calling me the vandal," he wrote. "I'm not a criminal I'm a freedom fighter." While "Guccifer 2.0" claimed to be a foe of "all the illuminati and rich clans which try to rule the governments," cyber investigators theorize that he may actually just be serving as the media liaison for the Russian government hacking teams suspected of breaching the Democratic Party's computer systems.